For more information on Rip Current Preparedness Week, June 7 to 13 in North Carolina, as well as North Carolina Sea Grant rip current research, read this news release. Rip current signs are posted on North Carolina beaches. Folks heading to the beach this summer should be aware of the potential for rip currents. National Weather Service officials report one fatality due to rip currents along our coast in 2014, and a total of at least 58 deaths since 2000. There are a variety of beach safety resources available to the public — including some right on the beach. “Lifeguards are not only on the beach to respond to emergency situations, but also to inform the public about current conditions. Talk to your local lifeguard when enjoying the beach this summer and always look out for your fellow friends and family while participating in water activity,” explains Simon Sanders, Ocean Rescue Supervisor for Carolina Beach. If you are planning to swim in the ocean, look for a location with lifeguards. If you are caught in a rip current, do not panic. If able, alert those on shore of your problem. Then swim parallel to the shore to get clear of the rip current. If you are on shore and see someone in distress, alert lifeguards and call 911. If you go in the water, take flotation devices for yourself and the person or persons caught in the rip. North Carolina partners continue to promote rip current safety by posting signs, providing magnets and sharing daily rip current outlooks from NWS forecast offices in Newport/Morehead City and Wilmington, N.C., and Wakefield, Va. Online safety materials also are available via the NWS portal at ripcurrents.noaa.gov/. Magnets, signs and brochures with the Break The Grip Of The Rip® national safety message are available from North Carolina Sea Grant. For prices go to ncseagrant.ncsu.edu/ and search for rip currents. For individual orders, call 919-515-9101. Communities, vacation rental firms and others with bulk orders also can call 910-962-2490. 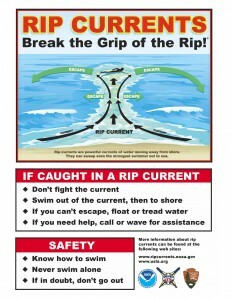 Download the rip current poster here.